Patina Old World Floors, manufacturer of high-end custom hand crafted wood floors, was founded in 1996 as an offshoot and sibling of Henderson Wood Floors, a flooring installation company. The company quickly made a name for itself amongst the wealthy community who could afford these labor-intensive hand scraped old world reproduction wood floors. 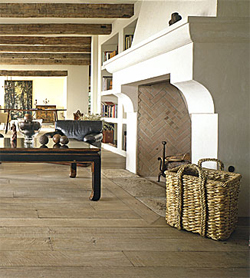 The founding concept of the floors came from the old parquet found in chateaux and old country houses in Europe. The flooring has the "patina" of the ages imbedded in every square inch, no one part the same as another. Founder felt that the large mansions in the United States might well enjoy just such character for their floors but today's owners can hardly wait the generations for it to develop naturally, so he set about creating the look and feel himself. It took research into the ancient methods of fashioning and maintaining the old floors coupled with the technology of today to recreate the style. Patina started with a variety of parquet floors, added solid wide plank, medallions and even a more modest level of flooring called "The Relics Collection" that brings much of the look and feel to a wider audience. Today, what typifies Patina is not only their unique textures and finishes but the fact that they specialize in working directly with the client whether that be the architect, interior designer, installer and/or the home owner, to create the floor they want for their house rather than offering a fixed catalogue of floors, take it or leave it. Patina, based in Oxnard, California, sells their floors world wide and through " Henderson Wood Floors will also install them anywhere in the world and does.